Our research mission can be divided into bottom up, curiosity-driven fundamental research and top-down, challenge-based activities: the common thread to these activities are biomaterials, especially silk. Current research in the Seib lab spans the nano- to macro scale in the examination of silk for use in drug and cell delivery. We have a particular interest in exploring the use of silk for drug and cell delivery applications. Silk is an approved biopolymer for use in humans and has remarkable physical properties (e.g. it is tougher than any manmade fibre). Silk, a common suture material, has long been recognised for its biocompatibility and biodegradability. We are using silk as a scaffold for tissue engineering and as a biopolymer for drug and cell delivery. Silk can be processed under mild aqueous conditions to generate several biomedically useful formats, including self-assembling silk hydrogels, nanoparticles, films and scaffolds. We study the cellular response of drug delivery systems, including nanomedicines. Nanomedicines are specifically engineered, multiple-component, nanosized drugs and drug delivery systems whose use is emerging as a promising approach for treating many diseases, including cancer. The drug payloads of nanomedicines can differ widely, but the effectiveness of any nanomedicine relies on its ability to reach the tumour microenvironment. In addition, the nanomedicine often must deliver its drug payload to a specific internal cell compartment in order to yield the desired therapeutic effect. 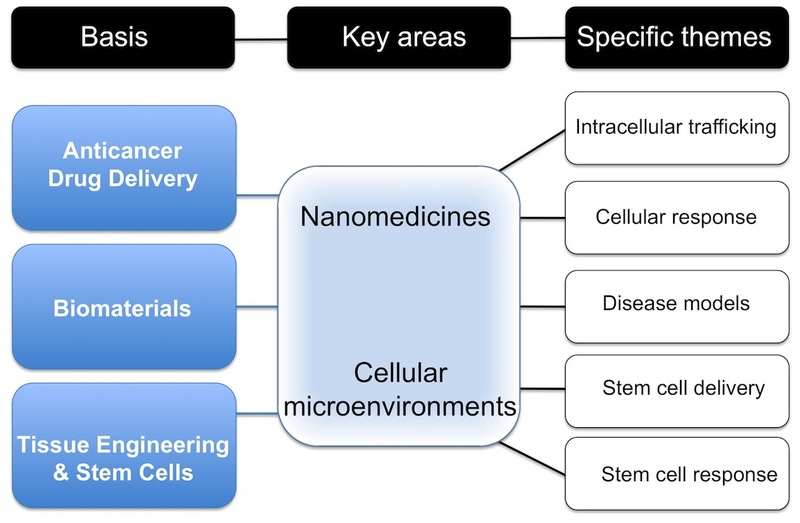 One of the bottlenecks for the translation of nanomedicines into clinical practice is the lack of suitable model systems for monitoring the cellular fate of nanomedicines, both in vitro and in vivo. Our laboratory focuses on the development of a repertoire of technologies for studying the cellular responses of nanomedicines. Our interests span the range from intracellular trafficking to application-oriented biocompatibility testing. Our in vitro research focuses on overcoming the issues that arise when cells are studied in a highly artificial context that ignores their native microenvironment. The typical in vitro cell culture environment strips cells of most of the contextual signals and physical cues that arise from accessory cells and the extracellular matrix (ECM) found in intact tissues (e.g. tumours). The standard culture substrate for cells is treated polystyrene, which not only fails to mimic the complexity of the actual cell microenvironment, but also generates an artificial two-dimensional cell layer. We are developing a number of culture systems that better reflect the cellular microenvironments that occur in healthy and diseased tissues, including the three-dimensional space that (stem) cells normally occupy in a tissue. We have recently extended the concept of an engineered stem cell microenvironment to three-dimensional scaffolds that are implanted in vivo and can serve as “traps” for circulating tumour cells. An emerging paradigm is that the stem cell niche can be hijacked by circulating tumour cells during the process of cancer metastasis. We are exploiting this feature to engineer artificial in vivo stem cell niches that selectively lure and trap cancer cells within the scaffold. The outcome of these studies will be unique new strategies for cancer therapy.